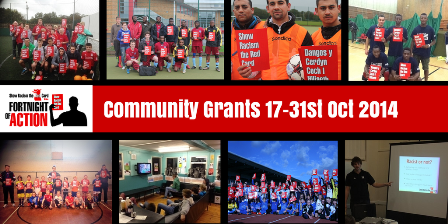 This season SRtRC Wales offered the opportunity for community groups, Clubs and schools to apply for a SRtRC Fortnight of Action Community Grant with the theme being Community United – Working together to tackle racism. Rob Dowling represented the Football Association of Wales in judging the applications who have provided funding for the Grant Scheme. This year we received a record number of applications from across Wales and the panel had a tough time deciding the successful applicants. Below is a list of the successful projects that have been funded by the scheme. Projects will be taking place from Friday 17th October 2014. Follow us on twitter @theredcardwales to be kept up to date with the progress of these projects. Will be running a 5 a-side football tournament with the aim to bring together community and faith groups throughout Cardiff through football. Will be running two “Water Pong” tournaments during the fortnight of action. The tournament will involve other local youth organisations/clubs joining young people from different backgrounds coming together taking part in a large scale Water Pong competition followed by the participants undertaking “ice breaker” activities from the SRtRC Educational Resource Pack to raise awareness of racism. Will be running a soccer school during half term in the Fortnight of Action. The young people will take part in football coaching and activities including an educational workshop about racism. Following these activities they will attend a Prestatyn Town first team match at Bastion Gardens. Will be linking with Cardiff City FC community foundation to deliver football activities alongside anti-racism education. Young people will also be creating an anti-racism poem/poster that will link into the SRtRC Creative Arts Competition. The school are then using the project to create a class assembly inviting parents to see the work that has taken place and to share the ‘show racism the red card’ message. To end the project the school will attend a Cardiff City FC championship game. Will be working with Cardiff City FC Community Foundation to deliver football activities alongside anti-racism education. The children and young people, all of whom have a disability, who attend the project will be current members of Viva! (Wales) they are aged between 11-30 years of age. Young people will also be creating an anti-racism poem/poster that will link into the SRtRC Creative Arts Competition. The young people will then have the opportunity to attend a Cardiff City FC championship game. Will be delivering a project aiming to encourage a better understanding of racism and Islamophobia amongst players and parents involved in the club. They will be showing an anti-racism stance prior to a match after holding a show case event in the community linked with AFC Butetown juniors. Will be delivering a project aiming to encourage a better understanding of racism and Islamophobia amongst players and parents involved in the club. They will be showing an anti-racism stance prior to a match after holding a show case event in the community linked with Cardiff Grange Harlequins. The players will be attending a Harlequins match and playing on the pitch at half time. Will be running a soccer school during half term in the Fortnight of Action. The young people will take part in football coaching and activities including an educational workshop about racism. Participants will also design their own anti racism posters using Port Talbot footballers and logo’s. Will be holding a project to raise awareness of the SRtRC fortnight of action at their match on the 11th October against Prestatyn Town. At this match all players and junior mascots will promote the SRtRC message by wearing SRtRC T-shirts at the commencement of the game. The club will be using their after school coaching sessions with Chirk Primary School to promote SRtRC messages. The project is to promote Refugee and Asylum Seekers impact on British sport. Having an open day inviting the wider Splott community to drop in to the centre and Participate in football activities, whilst receiving information on Asylum Seekers and Refugees impact on British Sport. The drop in football activities will promote integration between Refugees and the local community through a widely played sport across the globe. As part of the project 16 Asylum Seekers and Refugees will complete the FAW Football Leaders coaching award to develop more BME coaches in Cardiff. These 16 participants will be delivering the drop in centre football activities. The project Will be linking with Cardiff City FC community foundation to deliver football activities alongside anti-racism education. Young people will also be creating an anti-racism poem/poster that will link into the SRtRC Creative Arts Competition. Pupils will then deliver session to younger pupils at the school to see the work that has taken place and to share the ‘show racism the red card’ message. To end the project the school will attend a stadium tour at Cardiff City FC and have the opportunity to attend a match. The Fortnight of Action Grants Scheme has been funded by the Football Association of Wales and supported by the Big Lottery and Welsh Government.